KINGSTON, Ont. — Goaltender Brendan Bonello made 56 saves to back the Kingston Frontenacs to a 2-1 decision Sunday night over the North Bay Battalion, ending the Frontenacs’ Ontario Hockey League losing streak at seven games. 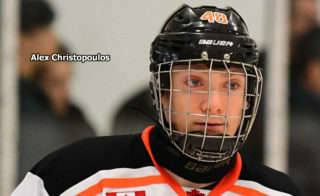 Tyler Burnie and Kallaway Mercer scored for Kingston, which has a won-lost-extended record of 12-30-1 for 25 points, fifth and last in the East Division. The win before 2,454 at the Leon’s Centre was the first for the Frontenacs since a 6-1 home-ice verdict Dec. 28 over the Peterborough Petes. Justin Brazeau scored for North Bay, which lost for the first time in four games and failed to garner at least a point for the first time since a 5-1 road setback Dec. 9 to the Hamilton Bulldogs. Goaltender Christian Purboo faced 31 shots for the Battalion, 21-19-3 for 45 points, third in the Central Division. The Troops, who completed a two-game road trip after downing the Petes 7-2 Saturday night, are 10-1-1 in their last 12 games. The Battalion, which outshot Kingston 27-5 in the third period in attempting to erase a 2-0 deficit, couldn’t capitalize on three power plays as Bonello produced several stellar stops, including flinging himself across the crease to block a Brad Chenier drive from the right-wing circle in the 12th minute. Purboo left for a sixth skater with 3:15 left, and Bonello foiled Chenier in close, Matthew Struthers at the lip of the crease and Mitchell Russell and Kyle Jackson as they dug for a loose puck at the right post. Brazeau finally beat Bonello at 18:57, putting a wrister high over the goaltender’s right shoulder on the short side for a team-leading 41st goal on the season. 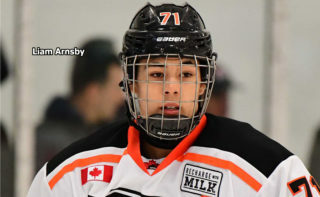 Struthers and Nick King earned assists as Brazeau tied Tye Felhaber of the Ottawa 67’s atop the OHL scoring race at 75 points. 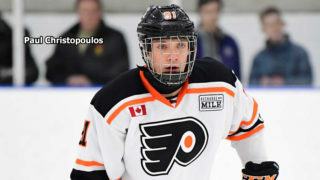 Purboo went to the bench again with 36 seconds left, but the closest the Troops came to the equalizer was with seven seconds to play when Luke Burghardt tried to convert a Struthers rebound at the goalmouth. A turnover led to Kingston’s opening goal, at 4:32 of the first period, as Burnie ripped a wrister high over Purboo’s glove from deep in the right circle. North Bay held an 18-16 edge in shots in the period, with Brazeau, King, Burghardt and Pacey Schlueting among those who tested Bonello. The Battalion’s best chance came on the period’s lone power play, when Chenier failed to get to a big rebound off a right-point drive by Braden Henderson. Mercer made it 2-0 at 14:36 of the second period, shoveling home the rebound of Adrien Beraldo’s left-point shot. The Battalion was unable to score during a two-man advantage lasting 1:46 late in the period. 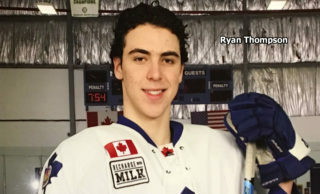 The Troops’ best chance came in the 12th minute as defender Evan Brand turned the puck over to Russell, who drilled the disc off the post, gathered the rebound and saw the subsequent shot repelled by the glove of a diving Bonello. He also foiled Brazeau on a drive to the net off the right wing in the seventh minute. The Battalion returns to the road Wednesday, meeting the Sudbury Wolves at 7:05 p.m. The game can be seen live in North Bay on YourTV Channels 12 and 700 and heard on Country 600 CKAT. 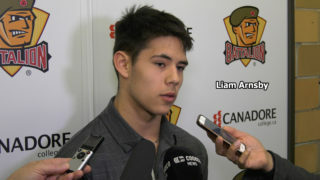 BATTALION BULLETS: In 243 games, Brazeau has 108 goals and 92 assists for 200 points. He’s the seventh player in franchise history to record at least 200 points. 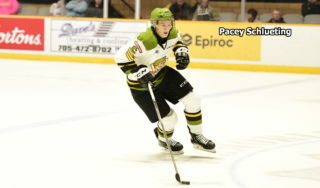 In three games against Kingston, Brazeau has six goals and four assists for 10 points … The Battalion’s total of 57 shots on goal and the 27 shots in the third period were season highs … King, who marked his 20th birthday, has a career-high seven-game points streak in which he has four goals and seven assists for 11 points … Struthers has a four-game points streak in which he has two goals and four assists for six points. He has two goals and eight assists for 10 points in three games against Kingston … Chenier saw the end of a career-high nine-game points streak during which he had eight goals and eight assists for 16 points. … Christian Propp backed up Purboo after a registering a career-high 50 saves at Peterborough … North Bay went 0-for-6 on the power play. Kingston was 0-for-1 … The Battalion, which dressed 19, one below the limit, was without Travis Mailhot, Simon Rose, Daniel Walker, Kurtis Evans and Cameron Peters … Walker completed a two-game suspension handed down after he was assessed a crosschecking minor and a misconduct and game misconduct for abuse of an official in a 4-3 overtime win Thursday night over the visiting Mississauga Steelheads … The referees were Ryan Harrison and Len Wood.